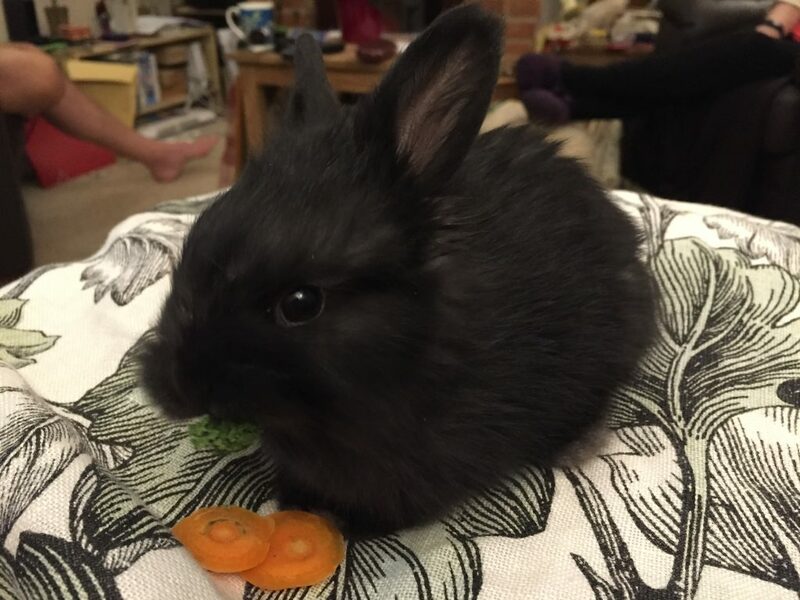 PJ was born on 14th November 2015. We were about to leave to visit Kew Gardens, Derek and our son in law to the Archives in search of ancestors and Orlanda and myself to wander around Kew Gardens. 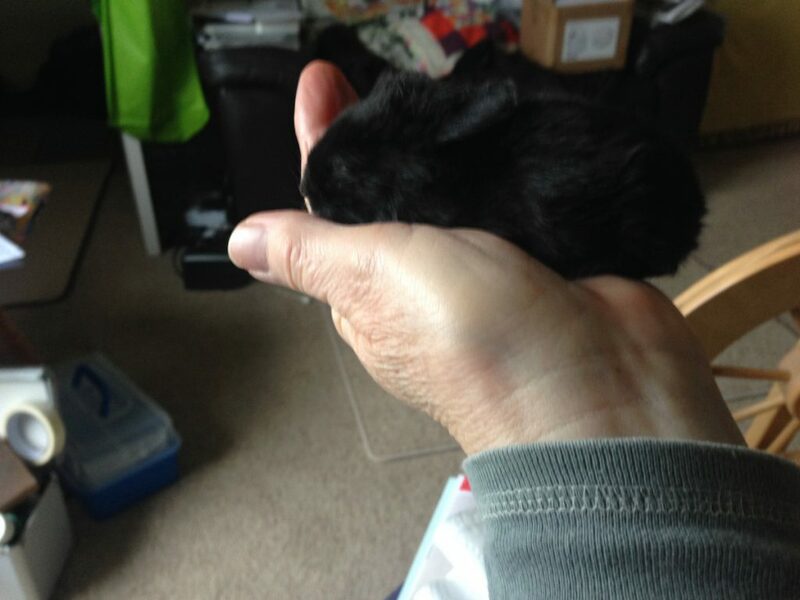 On doing a check on the rabbits, before I left, I found a smoke baby, born to Josca lying in the middle of the hutch cold and barely moving. As Josca is a real Prima donna, no fur or sign of nest building had taken place. So I removed it, brought it down to the house and put it in a knitted angora mitten on a hot water bottle and left for the day. I expected to find it dead when we arrived home after 5 pm in the afternoon, but surprise, surprise it was warm and moving. In order to give it the best chance, I took it back to Josca, still no nest, so turned Josca on her back and let it feed. Needless to say she wasn’t impressed but it fed. I continued to do this twice a day, weighing it every time to make sure it had gained a little. After two weeks, it was much stronger and bigger and I thought then it would be a buck, I supplemented the feed with Cimicat which he drank from a syringe. 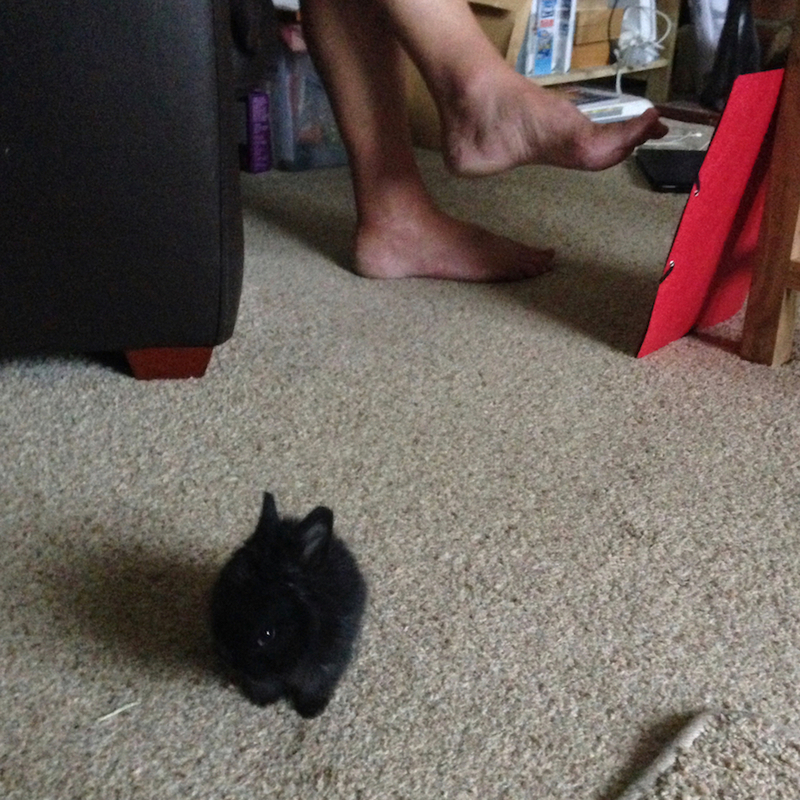 At three weeks he had the run of our house and was nibbling readigrass, kale, celery leaves and hay. From that time on he became ‘The Pest’. The boxes we were keeping him in were getting bigger, and taking up more room in the kitchen. 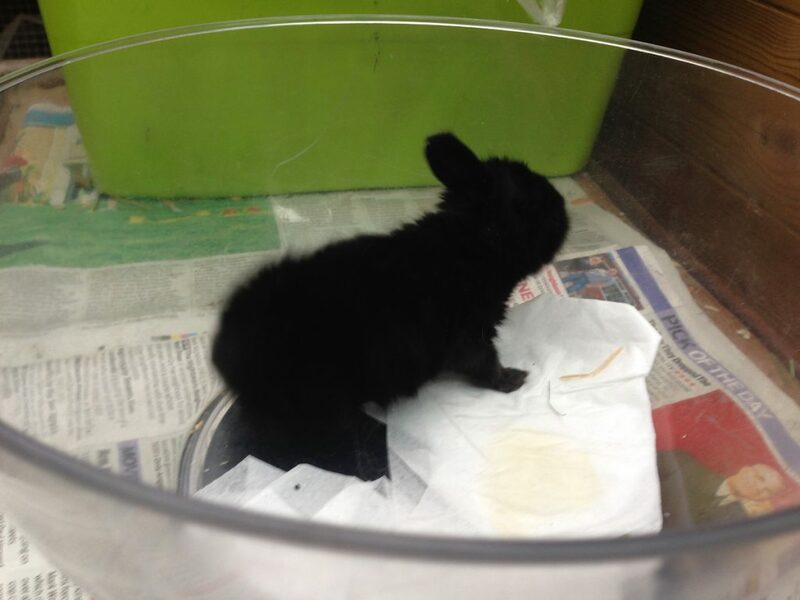 As it was early in the year he couldn’t live outside, so I started to put him in the rabbit shed for a few hours and bringing him back in the house at night. This made instructions for my friend looking after the rabbits while we were at Bradford and In Holland the week after, more complicated. 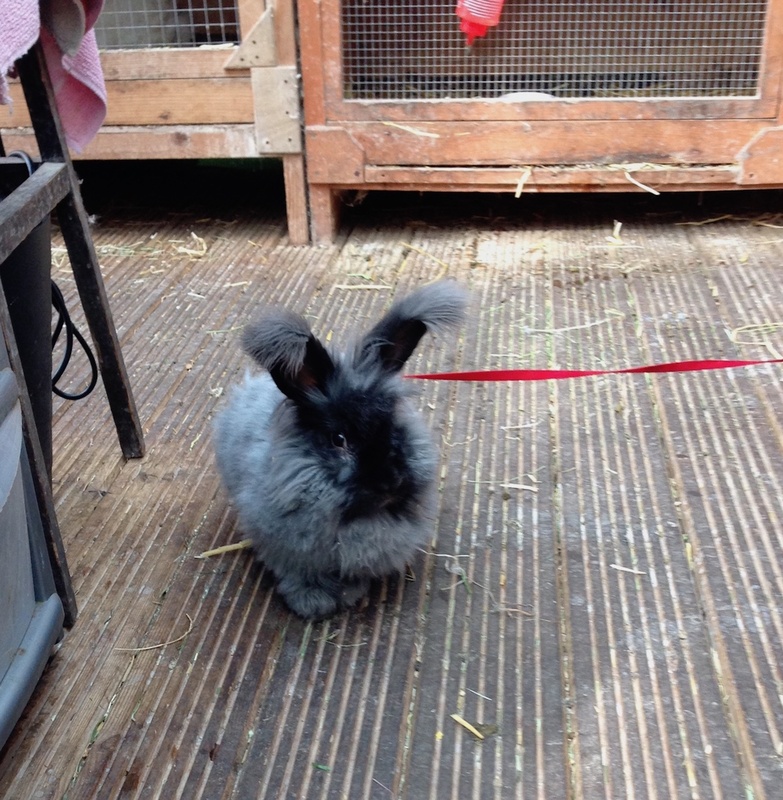 As he was so tame, and thought he was one of us, in order to appease him I got him used to a harness and lead so that he could walk about without getting into trouble. He is a dreadful sprayer, no one is safe. 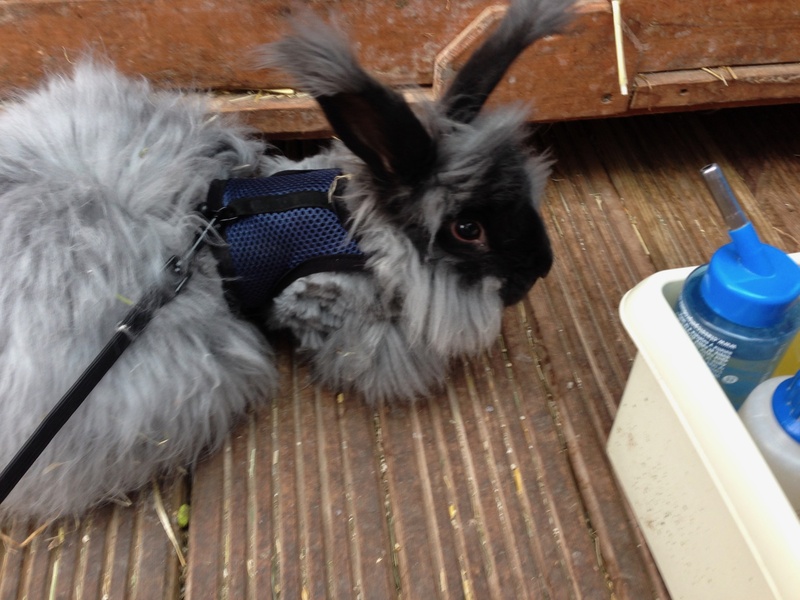 Now he is eighteen months old, he lives permanently in the shed but comes out on his harness when I am cleaning out or feeding. I decided to call him PJ as his mother is Josca and father Pasquale, despite numerous suggestions from my family. The moral of this tale is ‘ you reap what you sow’ spoiling a rabbit leads it to become a complete Pest, attention seeking, and demanding. Posted 01/12/2017 by SM & filed under Angora Welfare, General interest.